India's largest two wheeler manufacturer Hero MotoCorp on Monday launched its first 125cc scooter Destini in New Delhi as it seeks to ring fence itself from the strong challenge posed by former partner Honda Motorcycle Scooters India (HMSI). India's largest two wheeler manufacturer Hero MotoCorp on Monday launched its first launched Destini in New Delhi as it seeks to ring fence itself from the strong challenge posed by former partner Honda Motorcycle Scooters India (HMSI). Priced at Rs 54,650-57,500 the Destini will compete with the 125cc version of Activa, India's best selling scooter for nearly a decade, which in 2016 trumped Hero's long time bestselling motorcycle Splendor to become India's largest selling two wheeler nameplate. Showcased for the first time as the Duet 125 at the Auto Expo earlier this year, the Destini has been completely developed in-house at the company's Centre of Innovation and Development in Jaipur. It is powered by a single cylinder 125cc air cooled engine based on the Duet's 110cc powertrain, and offers a peak output of 8.7 bhp at 6750 rpm and torque of 10.2 NM at 5000 rpm. "The scooter market is witnessing a shift towards products with higher engine capacity. The 125cc segment in particular has been expanding at a rapid pace witnessing a growth of over 75 per cent year to date this fiscal," says Malo Le Masson head of global product planning, Hero Motocorp. "The 125cc segment therefore is a focus area for us and we are strategically following a multi-brand approach in this space. In keeping with this strategy we have debuted today in this category with the Destini 125 and will soon introduce another scooter towards the end of the year." Since parting ways with Honda in late 2010, Hero has managed its solo journey well holding on to its market leadership position. In the last five years, however, it has come under pressure from Honda that has benefitted from strong demand for scooters in the country while the sale of mobikes, a strong area for Hero, has relatively stagnated. Hero's market share between 2011-12 and the first half of this fiscal year (2018-19) has slid nearly 10 percentage points from 45 per cent to 35.74 per cent while Honda has gained at its behest in the same period growing its share from 14.89 to 28.89 per cent. Even though Hero has lost share in the motorcycle segment too in these 8 years from 55.88 to 50.8 per cent--Honda has gained from 7.66 to 15.11 per cent, its inability to find traction in the scooter market has been a particular worry. 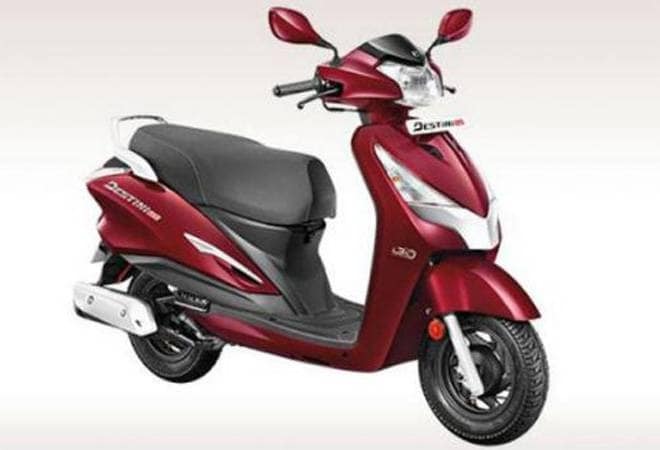 Despite repeated attempts with products like Pleasure, Duet and Maestro, Hero's share in the scooter segment has declined from 16.2 per cent in 2011-12 to just 10.42 per cent in 2018-19 so far. Powered by the Activa, Honda remains out of sight growing its share in the same period from 48.6 per cent to 58.16 per cent. With Honda closing in and breathing down its neck, Hero desperately needs a blockbuster success in scooters. The gap is big. None of its three existing models individually manage to sell more than 50,000 units in a month. Activa alone sells over 250,000 units every month. Hero hopes the Destini would help in bringing some parity.